Some strikes are better than others. People in dangerous or difficult professions get lots of sympathy. When a coal miner goes on strike, they make movies about it. When movie stars go on strike, it’s silly. Seeing an actor who pulled in 20 million dollars on his last film on a picket line is ironic and entertaining. They want to make people feel sympathy but it only works to make people giggle, if not sneer. 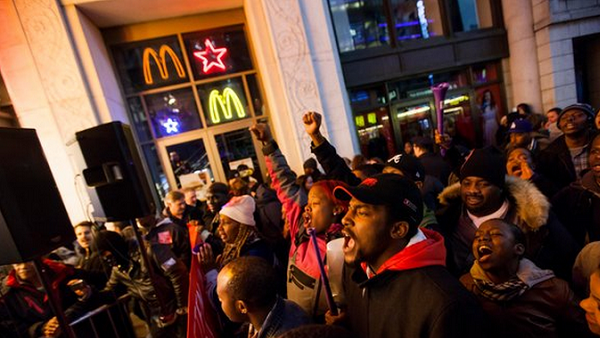 Then comes the fast food strike that took place recently. Low-wage workers with the simplest of jobs stood outside McDonalds, Wendy’s and KFC, chanting, “Hold the burgers hold the fries, make our wages super-sized!” I’m not kidding. They want double their current wages. Translation: They want to double the cost of the food you eat. Deeper translation: They want to shut down fast food restaurants. And, of course, end their jobs. More irony for you. The paying public realizes “super-sized” wages means super-sized prices on food. The food isn’t good enough to justify higher prices. That’s why people go there. Cheap food. Nobody in their right mind would buy a Happy Meal for $10 or a large fries for $5.50. If the average man or woman off the street can learn your job in 15 minutes, you don’t deserve a raise. That’s why so many of these jobs are held by teenagers who are still in high school. Oh, and there’s even talk of robots replacing these workers. A sad day for teenagers seeking their first job. The media, a union-run bunch, celebrated the one-day strike. Wouldn’t it be nice if they, like so many parents are doing as they read these stories, pointed out the lesson to the youth: Stay in school. Get an education. Work hard. Then you won’t make $7.50 an hour for life with the only hope of a raise coming from how loud you scream, rather than how skillfully you work.